On a recent scorching in Austin, Texas, Democrat Justin Nelson held a bar crawl in three bars within just a few blocks of each other — and each of those three different bars were in three different congressional districts. 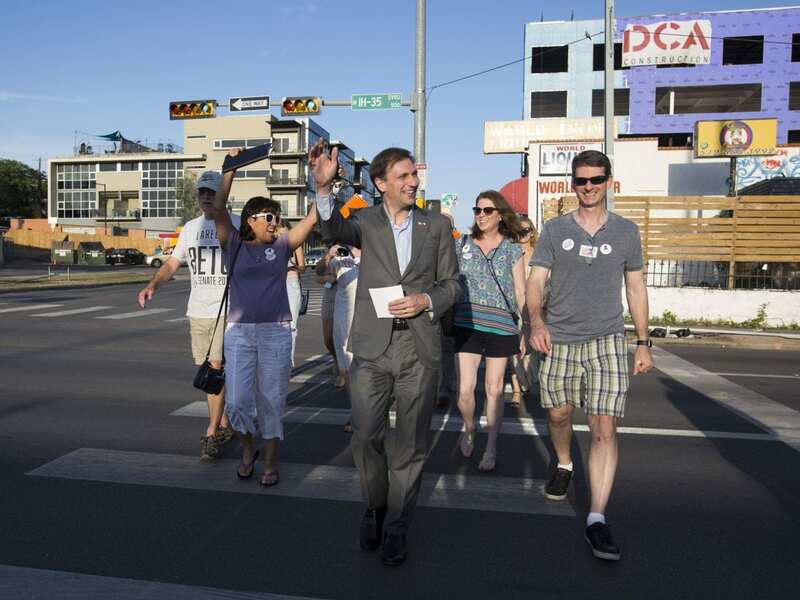 “Even in this baking hot Austin sun, you can walk these three blocks without even being totally drenched in sweat, because these districts are so close,” said Nelson, who is campaigning to replace the state’s Republican attorney general, Ken Paxton, in November. The way political maps are drawn is becoming a campaign issue for Democrats around the country. This follows the U.S. Supreme Court’s decision this term to not weigh in on whether it’s constitutional for political parties to draw political districts in a way that favors one party over another. However, the U.S. Supreme Court decided this year that it won’t hear that case. The high court instead decided to hear a racial gerrymandering case brought by Texas voters. That case alleged state lawmakers drew lines that hurt the state’s Latino and black voters. However, this summer, the court ruled mostly in favor of Texas lawmakers in that case. Paxton has supported and defended Texas maps and has said it’s OK for political parties to draw political maps in their favor. While a Democrat hasn’t been Texas’ attorney general since the 1990s, Nelson would be in a unique position to weigh in on political maps after a new round of redistricting in 2020. Texas’ attorney general sits on the state’s Legislative Redistricting Board and can be called upon to issue legal opinions on new voting maps. “There’s a fierce urgency of now — to talk about this issue now and get prepared for when the census is done down the road and when the next redistricting cycle happens after 2021,” Garcia said. Democrats around the country are mobilizing around the issue of gerrymandering, as well. But whether it’s enough to excite voters who often sit out midterm elections is another question. Jim Henson with the Texas Politics Project has done polling on the issue of redistricting for years. He said Democrats are increasingly concerned about gerrymandering, but the issue doesn’t mobilize them like health care and others do. “I think if you are a Democratic going to mobilize non-habitual voters on the Democratic side, there are buttons you are going to try to push far before you push something that is relatively technical like redistricting,” Henson said. Groups in Missouri, Oklahoma and Arkansas are currently gathering signatures in the hopes of getting similar measure on their states’ ballots. Just this past May, Ohio voters passed a ballot proposal requiring bipartisan cooperation in the legislature’s map drawing process for congressional districts.